@Adám what do I need to put in tio header to show box display? @Uriel Verbatim from tio bot. @Uriel Yes, Dyalog code assumes ⎕IO←1 and here we copy a function out of its context so the function expects ⎕IO←1 but gets 0. To participate in tonight's learning session without 20 Stack Exchange rep points, click lower-left giant avatar, then click "user profile" and there will be a number in the URL; that's your chat ID. Email your chat ID to adam@ with the domain being dyalog.com. @Uriel Utility functions, yes. Functions from the dfns workspace handle ⎕IO variations, but enableSALT was never intended to be run like that. Usually SALT is enabled at start-up. However, TIO runs a bare-bones system for performance. @Feeds what, why pi * 3, pi * 3, pi * 3, pi * 3? 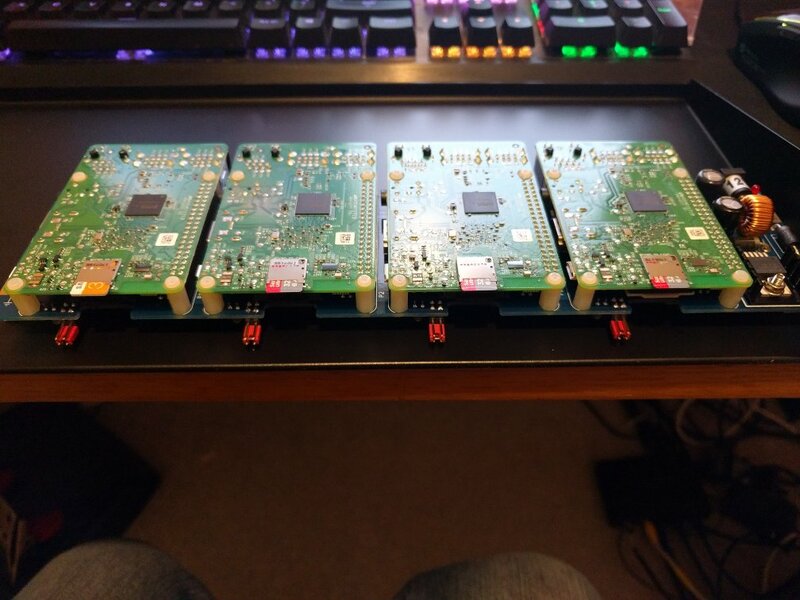 @EriktheOutgolfer We got four (Raspberry) Pi 3s (as "presents"). Adám is hosting another informal APL learning session tonight at 18:30 UTC in https://chat.stackexchange.com/rooms/52405/apl , continuing the previous week's "APL primitive functions' marathon". See https://chat.stackexchange.com/transcript/message/41299896#41299896 … if you don't have 20 Stack Exchange rep points. Welcome to the APL learning session! We're in the middle of our functions' marathon. Next up is ⍋, called "Grade". First time here, any quick notes on what I should know in terms of prior knowledge to the language or classroom etiquette? Note that you can follow the second link on the right to install a language bar, and key bindings so that you can easily type APL characters. @HyperNeutrino You can find previous lessons here. Only really lesson 1 is necessary. Please feel free to interrupt with any questions. Monadic ⍋ takes a simple (non-nested) array and returns the indices of the major cells reordered so that they would order the array. This means that the second element (1) is the smallest, then the fourth (1), then the first (3), etc. so grade(a)=b means that a[x] for x in b is the same as sorted(a)? @HyperNeutrino Exactly. Also, use the language bar so you can have proper APL characters. @HyperNeutrino However, you don't need the loop (for x in b) as APL allows indexing with an array, and the result has the same shape as the indexing array. @HyperNeutrino Well, I bet the U stands for "Grade Up". Jelly comes from J which comes from APL. Yeah. That seems to make the most sense. So the first is row 2 (1 8) then row 1 (2 7) then row 3 (2 8). so the ordering of the arrays is lexicographical or something? @HyperNeutrino First layer, second layer. Layer 1, layer 4, layer 2, layer 3. @all Anything else about monadic ⍋? what's the difference between ⍞ and ⎕? I don't quite understand cardinal numbers.. So P is the third, P is the fourth, C is the first, and G is the second. @HyperNeutrino ⍞← makes an inline response of the first line of the output, and without box drawing characters. ⎕← makes a multi-line response with boxed display. @Adám I thought those were ordinals? Or are you referring to what they return as ordinals? @RosLuP (2 2 2) (4 5 6)? does putting a space between the two ⍋ help? @EriktheOutgolfer It is so that the grade of the grade is the cardinal numbers. That is in the nature of grading. @HyperNeutrino Yes, if your numbers are all the integers from 1 to n.
@HyperNeutrino Because 3 is the third, and 5 the fifth. So grade grade returns the numbers fitted to 1 ... length(list)? @HyperNeutrino The period is 2. @HyperNeutrino You can evaluate an APL expression by typing it into chat prefixed by ⍞←. Use ⎕← instead for boxed display and multi-line results. Do not use markdown. Commands: )lb for language bar, )help for table of language elements, )docs for full documentation, )ref for PDF reference card. @EriktheOutgolfer ⍋ is the indices of cells in the order that would sort them. ⍋⍋ is the position each will take when sorted. If you think about it hard, you'll see what ⍋ swaps back and fort between these two. @Adám oh so it's the same, but different explanation? @HyperNeutrino It clearly tells the system that this line is not an APL statement. @EriktheOutgolfer No. they are different ways to state how an array is ordered. @HyperNeutrino Dyalog APL System Commands. so ⍋ once is what order the elements would be in when sorted and ⍋ twice is the indices that each element would go to? @EriktheOutgolfer ^ Column 1 says: the "lowest" letter is number two (a) while r is the sixth. ⍋⍋⍋ is equivalent to ⍋, right? @all Can we move on to dyadic ⍋? f⍣¯1 is inverse of f.
wait so is this essentially sort to a specific order? @HyperNeutrino Yes, but a bit more fancy. I'll show. So how come dyadic ⍋ isn't able to work on numeric arrays? Is there a specific reason? @Zacharý It would be possible, I guess, but not very meaningful. This 2D "alphabet" means that all vowels should come before all consonants, and only if otherwise the same, the vertical order will be considered. @Zacharý Yes, that's nice for golfing. Never thought of that. ⍬⍋ is shorter and dyadic too (good for trains). So this sorted all vowels before all consonants, and only then did it sort the vowels and the consonants. And you can have up to 15 levels of sorting using this. @Zacharý If a letter occurs more than once, then its first occurrence rules. This is useful to fill gaps in (e.g.) columns of unequal height. @all I think that's it for ⍋. Any questions? what are the main uses of ⍋ in real-life/practical usage? I don't see a reason why it should be limited to 15 levels? it's not like each level adds one dimension to the array is it? wait is there no sort monad? @EriktheOutgolfer Same reason as arrays having max 15 depth rank maybe? @EriktheOutgolfer Because the level increases the rank by one, and Dyalog arrays can max have rank 15. @Zacharý Rank, not depth. Depth may be infinite (bound by memory only). @EriktheOutgolfer I turned my ping sounds off. Wonder if chat is broken. @HyperNeutrino No, but I've argued that there should be one. @Zacharý CXO says: APL is not a golfing language. Sorry! so simply sorting a list is now to be considered something only useful for golfing languages? @EriktheOutgolfer It doesn't even sort everything, only simple vectors. What would be the shortest method for sorting everything then? wait what does simple vector mean in this context? @Zacharý J has it better: J's A⍋B is APL's B[⍋A] so you can sort B with B⍋B or ⍋⍨B. but ⍋2 3⍴3 3 6 5 3 2 works? @HyperNeutrino That has rank 2 but depth 1. It isn't nested, it just has two dimensions. How does that work, anyways? And how many chars is J's equivalent to ⍋. @RosLuP I don't think there is an operator for that. Next one will be quick: ⍒ is the same as ⍋ but grades descending. @EriktheOutgolfer What? Can you fix your grammar? @Adám I'll need to be there for that one. @EriktheOutgolfer Do ⍒'HelloWorld' using ⍋! @Zacharý OK, can we move on? OK, let's see if we can cover ⍳. Any bets on what ⍳0 gives? i'm guessing that's empty list? @Zacharý Yes. And what about ⍳0 0? @HyperNeutrino Nope. remember that the result must have the same shape as the argument. @EriktheOutgolfer What explains that then? @EriktheOutgolfer The reason for this strange result is that there is nothing to show, so the bot gives you the debug info instead. @EriktheOutgolfer Uh, you shouldn't be programming using a chat bot. Yes, use the desktop version and either the terminal interface, RIDE or (on Windows) the IDE. @dzaima Oh, no it isn't 0 0⍴⍬ because each element must have two element (coordinates), and in 0 0⍴⍬ each element has only one.